Hailing from Kiev, the capital of Ukraine, Fretting Obscurity is the solo-outfit of one Yaroslav Yakos. This multi-instrumentalist / vocalist wrote and recorded four lengthy tracks (in between thirteen and nineteen minutes), which are, when talking about the conceptual essence, partly yet profoundly based on several works of French philosophers and authors like Jean-Paul Sartre or Albert Camus and questions about existentialism and religion, the equilibrium of (or conflict in between) body and mind, ethic values within our (capitalistic) raison d’être, and the relationship in between life and death. Fretting Obscurity bring a very down-earthed, grim and oppressive form of Funeral Doom Death Metal. The ‘doom’ element has to do with extremely slow passages, which are like the basic structure of the whole album. As often, this goes perfectly well with a melodious attitude, with excellent twin riffs, dual leads and tremolo soloing as capital essence. The guitar-based structures are joined by plain yet technically outstanding rhythm section interactions, penetrated by some unique leads (which is not that weird if compared to the earliest works of Cathedral, seen the psychedelic atmosphere! ), and supported (or is it: enriched) by a vast scala on grim vocals: abyssal-deep grunts, wretched whispering, softly spoken words and rattling growls. Basically built around melodic structures, Fretting Obscurity balances in between a wide range of approaches: Evoken, My Dying Bride, Saturnus, Night Must Fall, Krief De Soli, very early Paradise Lost, Mournful Congregation, Skepticism, Doom:VS and the likes. the project draws it influences from the depth, the integrity, the discomfort, and the anxiety created by any of aforementioned acts. It has something depressed / depressing – not of the suicidal kind, yet rather funereal in approach. All pieces are varying, and then I am talking about the division of separated chapters within each track. Okay, these ‘chapters’ are not to be considered like diversified chronicles, for there is a coherent ‘glue’, organic for sure, going on. But the lengthy compositions have that naturally built-up interaction of somewhat diversified structural basics, with psychedelic ones interacting with melancholic excerpts, angry pieces playing in balance with dreamlike spheres, and emotional excerpts transforming into moments of dramatic grandeur. Some acoustic or semi-acoustic parts support that balance, which includes some hands full of more energetic and faster (read: less doomy) excerpts. Lyric-wise, Yaroslav delves deep into own experiences, emotions and thoughts. Personal incidents and dramatic circumstances, ideas about mankind, life versus death, tragedies and joyful pleasures, moments of spiritual catharsis, and the balance in between evil and (mental) peace, it’s just a concoction of the textual essence by Fretting Obscurity. The production, to end with, is more than all right. The sound quality is rich, full and well-balanced in mix, with a fine equilibrium in between the different instrumental (vocal parts included) details. 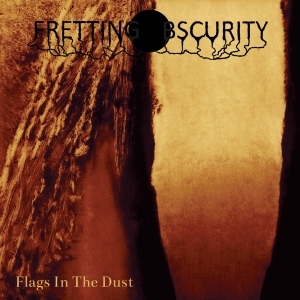 Flags In The Dust does not sound too clinically polished, and leaves some rawness in the production, lacking annoying noises or mistreated instrumental elements. So, in conclusion, I can end with a positive note, and that’s the fact that this album does not sound that bad at all for a first effort by some Ukrainian Doom-head. I think this material needs some ‘growth’, little more ‘depth’ and a more mature performance, but there is no reason to dislike the ideas behind this project. You might give it a try!